The remains at Gogarth lie on a level coastal terrace of sandy glacial till which overlies the limestone rock of the Great Orme. The site, which was formerly a residence of the Bishop’s of Bangor, is in two parts: a 13th century building (Block A), which consists of the remains of a stone built chamber block, and a 14th century complex (Block B), which includes a large hall with ancillary rooms. Block A is now on the cliff edge, and was half lost to sea, certainly by the 19th century and possibly by the 17th century. The building sits longitudinally along the edge of the cliff, and the seaward half of the building has collapsed over the edge, leaving the landward longitudinal wall and half of each of the two gable walls. Excavations carried out in 1955/6 revealed that the building had been burnt down, probably around 1400, and it was argued that Owain Glyndwr would have been responsible for the original destruction. West of Block A an additional structure was marked on the excavation plans, but it was not investigated during the 1955-6 excavations. During 1997-9 Cadw funded grant aid was received to enable the Trust to record the eroding section visible within the cliff face, and to carry out an excavation in-land of the section to place the remains in a wider context. The ivy covering the remains of Block A was removed, and the upstanding masonry was fully recorded. The work was published in 2000 (Davidson A., Bishop’s Palace, Gogarth, Caernarfonshire Historical Society Transactions, 2001, 59-80). Further erosion following the completion of work in 1999 has resulted in potential destruction of archaeological remains that were not recorded during 1997-9. In part this was because it was not possible to work close to a dangerous length of upstanding masonry, however the collapse of this section of wall in 2004 now made it possible to excavate up to the foundations of the batter of Block A, and to examine the relationship between the structure discovered in 1997-9 and Block A.
Hague had recorded the presence of massive burnt timbers lying on the floor of Block A, and it was therefore decided to excavate a small area within Block A to see if any burnt timbers remained in order to obtain a radiocarbon date from them. The erosion at the coast edge was rapidly encroaching onto Block B, and though a small area was examined in 1997, several questions remained concerning the date of stone cobbling and possible earlier foundations underlying the walls of Block B. - to examine the interior of the seaward structure of Block B. Four weeks of excavation were undertaken in August and September 2005. At Block A, the batter was exposed at the north-west corner of the building. The corner quoins were of dressed sandstone and limestone, the latter sourced locally, but the sandstone is likely to have been imported from Cheshire. The quoins were bonded with a white lime mortar. Abutting the batter was a four-metre long wall foundation that ran on a northwest to southeast alignment along the cliff edge. The remaining foundation of this wall was approximately 1m wide, and as the outer face of the wall had eroded, a foundation of some 2m must have been originally dug. At the north-western end of this wall, built onto a thin layer of rubble, was another wall, built from similar material but aligned southwest to northeast. This later wall had been built onto a layer of clay, and post-dated the construction of the medieval wall. A metalled surface, 0.10m thick and built from a random selection of sub-rounded and sub angular stone, was discovered directly outside the northwestern corner of Block A. It was built onto a compacted layer of sand that sealed the natural sand. The metalling appeared to respect the eroding wall, and is considered to be contemporary with it, but underlying Block B. A small excavation was conducted inside Block A alongside a baulk left in by Hague. This was successful in allowing the recovery of charcoal samples from charred timbers that lay within a layer of rubble. The rubble sealed a layer of clay, and a layer of lime mortar, possibly best interpreted as a construction layer. 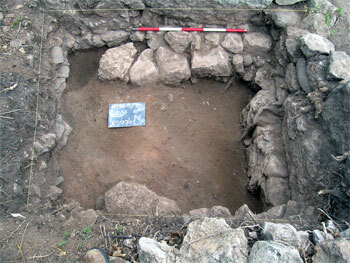 A small excavation was undertaken at the south-eastern end of Block B, within and immediately outside a small rectangular structure previously interpreted as a kitchen. The excavation exposed substantial foundations, built from mortared limestone, that lay at a slight angle to the wall above, though both were thought to be contemporary. The stone metalling exposed outside Block A also appeared to respect the masonry of Block B, and overlay the foundation course. It did not continue into the interior of the building.